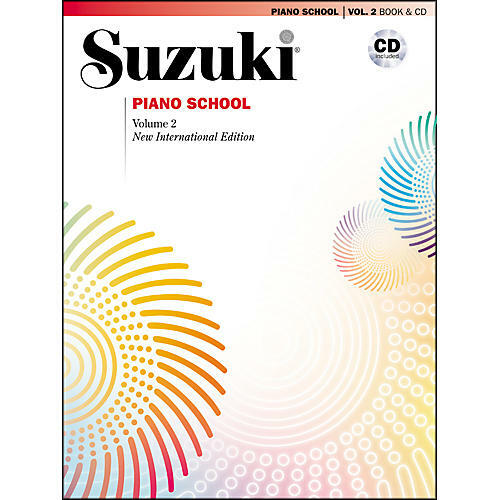 The New International Edition of Suzuki Piano School, Volume 2 includes French, German and Spanish translations, new Romantic and 20th-century pieces, as well as a newly recorded CD performed by internationally renowned recording artist Seizo Azuma. Now the book and CD can be purchased together or separately. The contents have changed slightly with minimal reordering of the music. The Mozart Minuet and Bach Musette from the earlier edition were eliminated and replaced with two new 20th-century pieces by Bart³k (noted below), and the Bach "Minuet in G Minor" (from J. S. Bach's Notebook for Anna Magdalena Bach) has been moved to Volume 3. Other improvements include a cleaner appearance with less editing and spacious new engravings, as well as more detailed titles that include the keys, sources, composer dates, and catalog numbers. Titles: ¢ ¦cossaise (J. N. Hummel) ¢ A Short Story (H. Lichner) ¢ The Happy Farmer, from Album for the Young, Op. 68, No. 10 (R. Schumann) ¢ Minuet in G Major, BWV 822 (J. S. Bach) ¢ Minuet in G Major, from J. S. Bach's Notebook for Anna Magdalena Bach (Anonymous) ¢ Minuet in G Minor, BWV 822 (J. S. Bach) ¢ Cradle Song, Op. 13, No. 2 (C. M. von Weber) ¢ Arietta (W. A. Mozart) ¢ Hungarian Folk Song, from For Children, Sz. 42 (Bla Bart³k) ¢ Melody, from Album for the Young, Op. 68, No. 1 (R. Schumann) ¢ Minuet in G Major, from J. S. Bach's Notebook for Anna Magdalena Bach (C. Petzold) ¢ Sonatina in G Major, Anh. 5 (Moderato, Romance) (L. van Beethoven) ¢ Children at Play, from For Children, Sz. 42 (Bla Bart³k).